Loyola University New Orleans proudly presents the United States Air Force Academy Band’s Big Band Jazz Ensemble, The Falconaires, on Wednesday, Oct. 19 at 7:30 p.m. in Roussel Performance Hall, located in the Communications/Music Complex on the corner of St. Charles Avenue and Calhoun Street. The concert is free and open to the public. Free parking is available in the West Road Garage located on West Road and accessible from St. Charles Avenue. An 18-piece big band consisting of full-time professional musicians from around the country, The Falconaires are all active duty airmen. 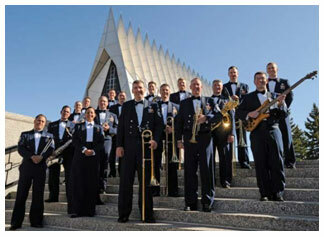 The band performs a broad spectrum of contemporary and traditional big band jazz and is one of 10 performing groups that comprise the entire 60-member United States Air Force Academy Band in Colorado Springs. They play tribute to all jazz styles from Glenn Miller to the latest cutting-edge charts. Led by their commander, U.S. Air Force Col. Larry H. Lang, the band appears annually for more than 50,000 people at prestigious events such as the International Association of Jazz Educators National Conference, the Music Educators National Conference’s National Convention, and Musicfest Canada. For more information contact Jess Brown in Loyola’s Office of Public Affairs at jlbrown@loyno.edu or call 504-861-5882.